We received your letter of March 23, 2014 yesterday. 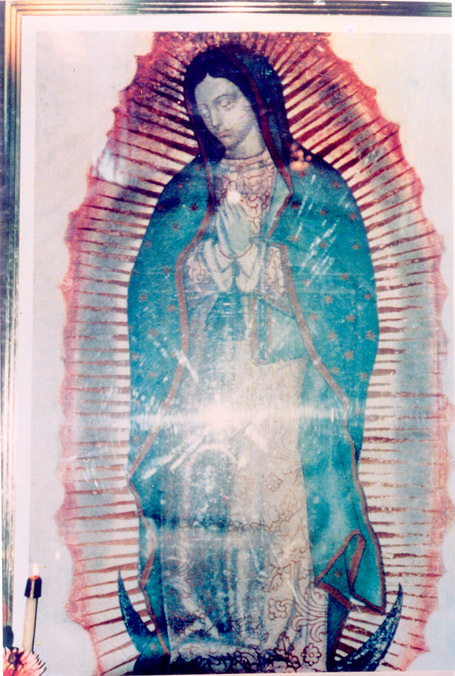 It was the first request from the Philippines for the photograph of Our Lady of Guadalupe. We are sending you several copies of this photograph taken at the National Shrine of Our Sorrowful Mother in Portland, Oregon, USA on August 15, 1991. These copies are completely identical to the original photograph and, therefore, can justly be considered true originals as well. You already know that the Image of Our Lady in Guadalupe is not a product of human intentions or hands but truly from God and the Blessed Mother. The images found in addition to the Image of 1531 are also no human products at all. These images are printed on cheap photographic paper, but nobody should treat this photo as a trivial piece of paper or a human product but we should respect and cherish it as a sacred and extremely precious gift from Heaven. Based on my observation, I can say that devils fear this image enormously and run away, probably even more so than the humanly-produced images. We believe that you and your friends who receive and keep this photograph will be specially blessed and protected as long as you have the faith and trust in God and Our Lady and truly love Them. I am glad that you and the Sisters of Mt. Carmel whom you visited have much devotion to Our Lady of Guadalupe. I know that the Philippines is a unique country in the world outside Latin America where Our Lady of Guadalupe is widely known and dearly loved. This devotion to Our Lady of Guadalupe can bring much blessing on the people of the Philippines. I also think your people have an important mission. As you know, the Image of Our Lady of Guadalupe has already been officially approved by the Church. I am not sure if the additional images also need a Church approval. But I do hope that, eventually, they will also be officially recognized by the Church even though it will take time. It may be necessary that this photograph becomes widely understood and loved before we send petitions to the Church authorities. Mary's Touch By Mail is a non-profit corporation registered with the State of Oregon since 1992. It is a very small organization of three lay persons (our son in New Mexico, my wife and myself) and a priest in Los Angeles. Because our financial base remains so weak, we propagate the information mainly through the Internet. In earlier years, we sent publications to other countries (mostly in Africa), but we cannot do this so anymore because of the high expenses. Therefore, we will not be able to respond to requests for photographs, books, DVDs, etc., unless the expenses are covered by those who make the requests. My ardent hope is that we can send the photograph of Our Lady of Guadalupe to everybody in the Philippines. This will be possible, only if sufficient funds are prepared by some of the faithful in the Philippines. A good understanding of this photograph is not easy and takes time. Please encourage your friends to visit our website (www.marys-touch.com) for more detailed information. This photo, we believe, is the completion of the original Image of 1531 and describes the current End Time when the Blessed Mother will conclude her spiritual war by triumphing over Satan and his forces (with the help of her children). May the blessings of the Lord and Our Lady be with you!